$2,200 Awarded to HSOY for Apprenticeship trainings for staff. $5,000 total awarded in 2018 to HSOY to support National Adoption Weekend Events. $44,520 total awarded in 2018 to HSOY as a part of the Network Partner Adoptions Reward program. Faure Foundation awarded a total of $6,500 to the Humane Society of Yuma in 2018 for the direct care and comfort of shelter animals. Thank you Faure Foundation for your continued support of the Humane Society of Yuma. $10,000 awarded to HSOY from the statewide animal welfare fund to support the Community Cat Program. $1,000 awarded to HSOY from the San Luis Community Fund for Microchips for San Luis Residents and Scanners San Luis Animal Control Officers. $35,000 awarded to HSOY to help reunite people with their pets and to keep pets in their homes. Arizona Companion Animal Spay/Neuter Committee awards the Humane Society of Yuma a total of $18,000. The Arizona Companion Animal Spay/Neuter Committee has awarded the Humane Society of Yuma $10,000 for the Public Spay/Neuter Program and $8,000 for the Community Cat Spay/Neuter program. These funds will be exclusively used for spay/neuter and assistance is based on the need and availability of grant funding. These grant funds were made available from the support and sales of the Arizona Companion Animal Spay and Neuter Pet Friendly License Plates. As such, we encourage our supporters to purchase the plates for your vehicle. Thank you, Arizona Companion Animal Spay/Neuter Committee for selecting the Humane Society of Yuma! $35,000 awarded to HSOY for Spay/Neuter Clinic from Yuma Animal Welfare fund. $50,000 awarded to HSOY to support Transport Program. 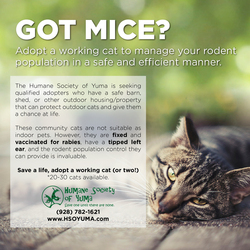 The Humane Society of Yuma has partnered with Best Friends to help manage the intake of community cats at the shelter and has provided tools for the shelter to use to help mitigate the concerns of the Yuma community. Thank you Best Friends Animal Society! Maddie's Fund Awarded HSOY $4,000 to support Foster Care Program. Thank you Maddie's Fund for helping us purchase 40 Kitten Foster Kits. In preparation for Kitten season we will be better equipped and ready to save more lives! Yuma Kennel Club Awards HSOY $1,000 to upgrade Radios. Thank you Yuma Kennel Club for your ongoing support and generous donation. PetSmart Charities Awarded HSOY $10,000 to subsidize Spay/Neuter for Owned pets. Thank you PetSmart Charities for supporting the Humane Society of Yuma's Low-Cost Spay Neuter Clinic. $10,000 Awarded to Humane Society of Yuma for General Veterinary Care of shelter animals. 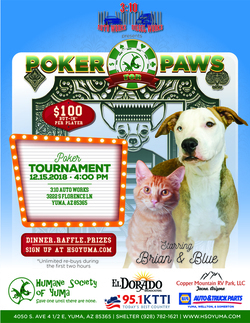 The Humane Society of Yuma is proud to partner with Bissell Pet Foundation to help care for the homeless pets of Yuma. With this funding we can continue to intake animals and provide quality veterinary care. We want to thank Bissell Pet Foundation for their support in our organization, they are helping us towards our mission of reducing the number of homeless pets in Yuma County. This past Tuesday, October 24th at the Arizona Community Foundation of Yuma’s Heart of Yuma recognition event, it was announced that the Humane Society of Yuma was awarded $35,000 from the privately funded animal welfare fund, strictly for spay/neuter efforts in Yuma. The Humane Society of Yuma’s mission is to reduce the number of homeless pets, and sterilization is one of the main methods in which we pursue our goal. In an effort to reduce the number of stray animals and unwanted litters entering our shelter, the granted funds will subsidize the cost of approximately 539 surgeries for pets belonging to families in Yuma County for whom the services would otherwise present too great a financial burden. While there are no mandates requiring pets to be sterilized, the state of Arizona requires that all animals adopted from shelters be spayed or neutered before being rehomed. We encourage everyone in the community to also do their part in reducing the number of homeless pets by having their animals sterilized, and we do everything in our power to provide them with an avenue to acquire those services. The funds that have been received goes directly to subsidize surgery costs for the public and will not be used for funding for the homeless or adopted animals. In 2016, the Humane Society of Yuma’s Clinic performed 4,789 surgeries; of which, 1,318 animals were owned pets. This year we estimate that number to be over 5,000. Additionally, we project to perform over 1,500 surgeries for owned pets in the community. Again, we encourage the public to sterilize their pets and HSOY’s clinic exists as a low-cost option to do so. It is with the donations from the community and grants, such as this one, we receive that makes these low cost services possible. 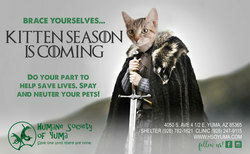 The Humane Society of Yuma is making our spay/neuter program a priority. Not only have we increased our capacity for surgeries, we have also made the appointment process available online. $10,000 awarded to HSOY from the statewide animal welfare fund to support the Rescue Program. The Arizona Companion Animal Spay/Neuter Committee has awarded the Humane Society of Yuma $8,000 for the Public Spay/Neuter Program and $6,000 for the Feral Cat Spay/Neuter program, also known as Feline Friends. These funds will be exclusively used for spay/neuter and assistance is based on the need and availability of grant funding. These grant funds were made available from the support and sales of the Arizona Companion Animal Spay and Neuter Pet Friendly License Plates. As such, we encourage our supporters to purchase the plates for your vehicle. Additionally, the 2017 tax year will be the first year the State of Arizona will allow tax payers to donate to this fund via tax forms, which will make it easier for our supporters to contribute to spay/neuter efforts across the state. Thank you to PetSmart Charities for funding the Humane Society of Yuma’s Keeping Families Together Grant of $35,000! This grant will help low-income families reclaim their animals with subsidized fees on an as needed and discretionary basis. It is beneficial for all parties, the pet, the family and the Humane Society to return the animals back to their loving families. Finances do not dictate the amount of love an animal receives and this program provided by PetSmart Charities values the role pets play in the family. Grant of $30,000 will extend efforts to save more animal lives in Yuma, Arizona. [July, 2017] The Humane Society of Yuma has been awarded a $30,000 grant from the Petco Foundation to support its lifesaving efforts. 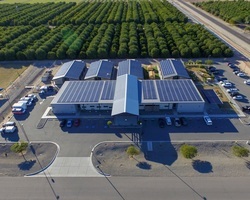 The Humane Society of Yuma is a nonprofit organization governed by a Board of Directors and is independently funded by donations, grants, and municipal contracts; this funding is utilized to support the adoptions, clinic services, rescue partners, foster program, and community education of animal welfare and protection, serving over 5,500 square miles of the Southwest border of Arizona. Since 1963, the Humane Society of Yuma has evolved into an adoption and spay/neuter organization. On average the Humane Society of Yuma intakes over 8,100 animals. In 2016, the Humane Society of Yuma saved more than 5,400 lives and altered over 4,700 animals (projected to alter over 5,000 animals in 2017). As an organization, we believe that adoption and spay/neuter programs are the humane solutions to the pet overpopulation. The Petco Foundation investment will help prepare approximately 85 animals for adoption. On average it costs the Humane Society of Yuma more than $350 per animal to feed, vaccinate and spay or neuter each animal in preparation to get them to be adopted. In 2016, the Humane Society of Yuma adopted out over 2,600 animals; this wouldn’t be possible without grants such as this and donations from the local Yuma community. All adopted animals are spayed or neutered, which also helps decrease the pet population in Yuma and will save many more lives. “As a non-profit entity, our goal is to make adoption the preferred method of adding a pet to a home. That being said, making adoptions affordable is key to saving more lives. We know that making this possible runs a financial deficit when it comes to investing in the animals’ care and treatments; which is why funding from the Petco Foundation is imperative in making a difference in our life saving efforts” said Annette Lagunas, Executive Director. $10,000 for Veterinary Assistance Grant received September of 2016. *Will provide approximately 500 vaccinations for low-income households. Income qualification is required. $10,000 for Spay/Neuter for Rescue Program received October 2016. *Will provide approximately 153 spay/neuter surgeries for animals going to partner rescue organizations. $5,000 for Low-Cost spay,neuter, vaccines, microchip and other medical services and supplies deemed necessary by veterinarian. Received October 2016. *From an anonymous donor's fund. *Will subsidize funding or approximately 140 animals belonging to low-income households. Qualified households only. *Will provide approximately 179 spay/neuter surgeries and vaccinations for our Trap, Neuter, Release program. Please consider supporting this committee by purchasing an Arizona Pet Plate for your vehicle. Sales of these specialty license plates go towards funding spay/neuter programs across Arizona and help organizations, just like the Humane Society of Yuma.